battery power with a few hours' battery life (so I don't have to haul the brick into the meeting, find a power outlet, deal with an extension cord, etc. 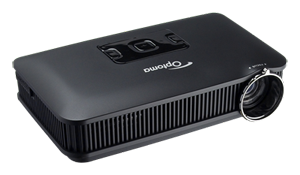 After a lot of research I zeroed in on the Optoma PK301 Pico Projector. When I first opened it up and tried it out, I thought it was the perfect solution. Setup was zero friction. Projection was surprisingly bright and seemed very clear on first view. Battery life met expectations. Does it meet the need? Not quite. Alas, it isn't perfect after all. The Web application I present has text content, and the text is simply unreadable, even when projecting a very short distance to a small screen surface. Also, when I tried to make a presentation in a conference room with ten people, requiring a larger display, we had to turn off the lights. And the text was still unreadable. A show stopper. A smaller problem is that its highly desirable light weight makes it easy to bump it out of aim. Moving the laptop is almost sure to propagate movement of the video cable that moves the projector. If I kept it I would have tried to apply a suction cup to it in some way. Also, an odd aspect of its physical design is that it leans slightly when set normally on the table, necessitating putting a few sheets of folded paper under the end opposite the lens. Projection Distance 8" to 189"
For use with the pico projector, I got this portable screen. When it arrived I was very surprised at its weight...one spec that I didn't find after looking at its specified dimensions. It sure isn't going into a laptop case. It comes with its own cover and I just carried it separately. It is ok. It works as expected. Pull out the screen and it stays where you pull it to. Push it back in and it's ready for travel. I'm still hoping for a portable tabletop screen that is light and not bulky. Newer PostAre Home Theater PCs Ready for Prime Time?